Although he died five years before the country was created, Ernst Thälmann was East Germany’s greatest hero. He was to the GDR what George Washington is to America: an icon and a founding father, preternaturally moral and incapable of mistakes. Both men fought for freedom from oppression. In Washington’s case, that oppression came in the form of English taxes that were cutting into the profits of the American businessmen. In Thälmann’s case, much of the oppression came from the businessmen, who seemed to be the only people not affected by the staggering inflation that was strangling Germany’s working class. 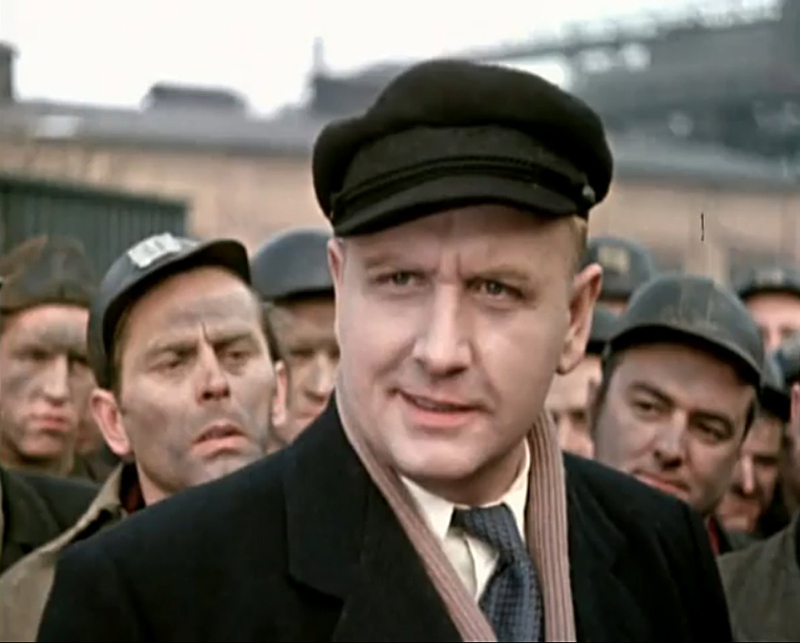 DEFA made two Ernst Thälmann films: Ernst Thälmann – Sohn seiner Klasse (Ernst Thälmann – Son of the Working Class), and its sequel, Ernst Thälmann – Führer seiner Klasse (Ernst Thälmann – Leader of the Working Class). Although they premiered a year apart, they are, essentially, two halves of the same film. Both are directed by Kurt Maetzig with the same cast, crew, and visual style. Nonetheless, most people, including the director, consider the first film to be the better of the two. As is often the case with historical dramas intended for a home country crowd, the film assumes a certain level of familiarity with Ernst Thälmann and events in Germany‘s past, so some background is in order. Ernst Thälmann (“Teddy” to his friends) was the son of a Hamburg businessman. At an early age, he found himself repulsed by the capitalist business model, favoring the hard-working world of the proletariat instead. He got a job as a stoker on a freighter and joined the SPD—Germany’s leading socialist party. During WWI, he was drafted to fight on the Western Front. Thälmann wasn’t crazy about the life of an infantryman, and often found himself at odds with his superiors. After the war he returned home to a country deep in throes of change. The SPD had splintered, with its more left-wing members abandoning the party to found the USPD (Unabhängige Sozialdemokratische Partei Deutschlands), joining Rosa Luxemburg’s and Karl Liebknecht’s Spartacus League. But this agreement was not long lived. Fights broke out over whether the group should join the Comintern—the Soviet Union’s International Communist organization dedicated to spreading Russia’s version of communism. Eventually the USPD was absorbed back into the SPD and the Spartacus League members went on to found the KPD—a very pro-Soviet Communist party (I realize that I’ve abbreviated the facts here, but a fuller description would look like alphabet soup). Unwilling to acknowledge their defeat, some of the military leaders, most notably Erich Ludendorff—the German general who famously considered Hitler “too moderate”—put forth the “stab-in-the-back” theory (Dolchstoßlegende), which maintained that Germany’s efforts to win the war were thwarted by traitors at home, specifically Jews and Communists. For some ex-soldiers returning from the front, this theory was compelling. It justified their sacrifices and denied their actual defeat. Many of these men joined the Friekorps—private militias made up of returning soldiers who took upon themselves to enforce whatever laws and positions they agreed with. It was members of one of these Freikorps that killed Rosa Luxemburg and Karl Liebknecht, dumping his body in the Tiergarten and hers in the Landwehr Canal. After the murders of Luxemburg and Liebknecht, Thälmann took over the reins of the party, making it even more pro-Soviet and less compromising than before. Meanwhile the Freikorps got too big for their britches, eventually collapsing during the Kapp Putsch—a failed attempt to takeover the German government. After that, ex-Freikorps members looked for a new outlet for their rage and found it in Hitler’s newly-formed Nazi party. The first movie starts with a bang—literally—opening in the middle of a battle on the Western Front in 1918. Ernst Thälmann and a group of like-minded soldiers are in the thick of it when they hear the news of the German Revolution back home, the abdication of Kaiser Wilhelm II, and the release of Karl Liebknecht from prison. Thälmann and crew decide they’re tired of fighting for all the wrong reasons. They declare their alignment with the Bolsheviks in Russia and raise the red flag over their trenches. Right off the bat, we are introduced to four of the main characters in the story. On the side of good and righteousness are Thälmann (of course), and his close friend, Fiete Jansen. In the opposite corner are the evil Zinker and his stooge, Quadde—played by Werner Peters in a kind of extension of his character in The Kaiser’s Lackey. After the mutiny in the trenches, the film moves away from the action on the front and goes to the political intrigues that were tearing Germany apart at that time. Zinker comes back into the picture as the leader of the Freikorps responsible for the deaths of Luxemburg and Liebknecht. Kurt Maetzig understood that for a film to be emotionally satisfying there has to be dramatic tension and some sort of resolution; tragic or otherwise. Unfortunately, history in this case rarely affords such opportunities. Historically, the men most responsible for the deaths of the two revolutionaries were Freikorps captain Waldemar Pabst and his lieutenant, Horst von Pflugk-Harttung, neither of whom faced any charges for the murders, and went on to long and successful careers in West Germany (Von Pflugk-Harttung worked as a Nazi spy during WWII, and faced charges for it, but the U.S. government decided that he was more anti-communist than fascist and that was okay by them). In Zinker we have a perfect villain and we are allowed a resolution to the story that history denies us. Kurt Maetzig also recognized that, by himself, Thälmann was not that emotionally engaging a character. He could be stiff, didactic, and so devoted to the cause of communism as to render any romantic possibilities inconceivable. To help the story along, the films follow the romance of two of his co-conspirators, Fiete Jansen and Änne Harms. Jansen acts as sort of an apostle Paul to Thälmann’s Jesus. We see him travel from Spain to Russia, spreading the gospel according to Thälmann, turning his old buddy into a martyr for the cause. Jansen is in love with Änne Harms, whose father we met briefly at the beginning of the film. It is Änne that is the most compelling and the most tragic character. She is the only one with conflicted attitudes, so when she finally decides to join the party it’s not an empty gesture. We may admire Thälmann, but it is Änne that we care about. Thälmann returns to Hamburg in time to hear the news of the deaths of Luxemburg and Liebknecht and immediately steps into his role as the leader of the KPD. He helps organize the Hamburg Uprising and organizes people to put down the Kapp Putsch (in truth, Thälmann’s part in the defeat of the Kapp Putsch was minor if anything). As with Maetzig’s previous film, The Council of the Gods, much of the blame for the situation that led to the Nazis taking over Germany is laid not at the feet of the Germans themselves, but on the doorstep of American corporations, who manipulate the situation in Germany to line their pockets; a kind of communist version of Dolchstoßlegende. The second film doesn’t have the luxury of a nice, dramatically satisfying resolution. After all, history tells us that the Nazis imprisoned Thälmann after the Reichstag fire, keeping him in solitary confinement for eleven years, eventually assassinating him in 1944 at Buchenwald and blaming it on an Allied bombing attack. The film starts in Berlin in 1930, thus scrupulously avoiding some of the most scandalous years in Thälmann’s political career. The Nazis have not yet come to power, and Thälmann is now a member of the Reichstag and chief of the KPD. He is as resolutely communist as ever. Tensions have grown worse between the SPD and the KPD, and (according to the movie anyway) it is the failure of the members of the SPD to realize their folly that leads to Hitler’s ascendancy. If Thälmann is treated with kid gloves in the first film, he is treated with downright reverence in the second. Understandably, then, the film does not show his eventual murder, preferring to end, instead, upon his transfer from Bautzen prison to Buchenwald in blaze of heroic sacrifice as the red flag of Soviet-style communism waves behinds him. It’s a bit much and Maetzig knew it, but anything else most likely would have been rejected by the SED authorities at that point. Upon its initial release, the second film included scenes with Josef Stalin, showing his strong support for Thälmann. These scenes were added at the express request of party officials. When the film was released in October of 1955, Stalin was still being championed in East Germany and the Soviet Union as the greatest communist leader who ever lived. Five months later, at a speech in a closed session of the Twentieth Party Congress of the CPSU, Khrushchev delivered his On the Personality Cult and its Consequences speech, denouncing Stalin’s dictatorial rule, and heralding the beginning of the Soviet Union’s “De-Stalinization” program. 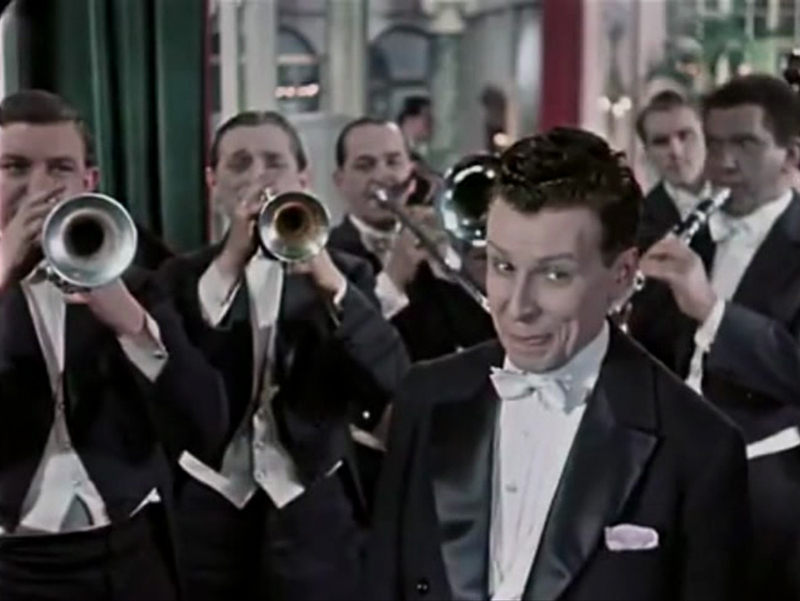 Copies of the film were pulled and re-edited to remove the now-offending scenes, although the role of Josef Stalin still appears in the opening credits. Director Maetzig was at the top of his form here. His work is crisp and satisfying, especially in the first film. In one memorably comic sequence, the action shifts from a parade of workers marching in the streets to a decadent cabaret where a man in a tux cheerfully sings “Yes We Have No Bananas.” Considering the difficulty East Germans had in acquiring this particular fruit, thanks the United Fruit Company’s near-stranglehold on production back then, this scene must have caused some chuckles. Maetzig would go on to make better films, but the fact that these films are still worth watching is a testament to his skill as a filmmaker. Playing Thälmann is Günther Simon, the star of such East German classics such as Vergesst mir meine Traudel nicht! (Don’t Forget My Little Traudel), Meine Frau Macht Musik (My Wife Wants to Sing), The Sailor’s Song (Das Lied der Matrosen), and The Silent Star. Simon’s turn as Ernst Thälmann, was so believable that it actually threatened to hamper his career. When Hans Heinrich chose to cast him as the lead in his musical comedy, Meine Frau macht Musik, there was some push back from the authorities, who didn’t think the man who portrayed the great Ernst Thälmann should appear in something so light-hearted. Simon got the role anyway, however, and proved that he was as good at light comedy as he was he was at drama. Simon died in 1972, and is buried in the Dorotheenstadt cemetery in Berlin’s Mitte district. As Fiete Jansen, Hans-Peter Minetti is an interesting combination of Mr. Nice Guy and iron-willed revolutionary. With Thälmann in prison for most of the second film, it is up to the Jansen character to provide most of the action. This is not an easy part to make interesting. In the first film, at least we get some opportunities to see Jansen interact with his future wife, Änne, but those are taken from us in the second film. He is a man alone, and most of his interactions are with people he sees only once. Minetti does a good job in the part, as well he should, coming from an acting family as he does. His father, Bernhard Minetti, was a successful actor in the Weimar days, and later during the Third Reich, when he appeared in Leni Riefenstahl’s Lowlands (Tiefland), and The Rothschilds, one of the most notoriously anti-Semitic films of the Third Reich. Hans-Peter, like many sons throughout history, rebelled against his father’s fascist philosophy and took up the communist cause. After WWII, Hans-Peter went on to a career in East Germany, while his father and his sister Jennifer worked in the west; primarily in theater. Because of his strong communist beliefs, Hans-Peter went on to become an important figure in the East Germany theatrical community, a fact that hindered his film career after the Wende. His son, Daniel Minetti, has gone on to a successful career in German television. But it is Minetti’s counterpart, Karla Runkehl that really steals the show. As the strong yet vulnerable Änne Harms, Runkehl turns in a performance that she would never equal in her career. It became the model for the good socialist woman. For her work in the Thälmann films, she was awarded the Art Prize of the GDR in 1959. Runkehl got her start in acting at DEFA’s young people’s studio, and appeared in many films, mostly in supporting roles. She also had a successful career on the East German stage, making guest appearances in production throughout East Germany. Runkehl died on Christmas Eve, 1986 in Kleinmachnow. It’s unfortunate that these films probably won’t see a theater screen in America any time soon, because their use of color is spectacular (my screenshots from a weak DVD copy don’t really do them justice). As others have noted, the cinematography rivals Jack Cardiff’s work in the Powell/Pressburger films. While most of the visual information in these films is painted in broad strokes of army green and sienna brown, the red flags, bandannas, and armbands of the communists pop out of the screen like fireworks. The battle sequences are as good as anything Hollywood ever came up with. DEFA had not yet discovered the joys of widescreen filmmaking, which is too bad because these sequences were practically made for that format. Willy Schiller’s and Otto Erdman’s production design is almost perfect, from the battlegrounds on the Western Front to the labyrinthine catacombs of the Hamburg sewer system. The only weak spot in the production occurs in the second film during the bombing of the women’s prison, where the problems of scale are apparent. Having the Brandenburg Gate on their side of the border certainly helped give power to the KPD march scenes in the first film, but I couldn’t help but wonder what the American military folks a couple blocks away thought of all that marching and flag-waving. Matching the film’s visual hyperbole, Wilhelm Neef’s score is epic and anthemic. This was the fifties, after all, and huge triumphant scores were the order of the day. Matching the pompous grandeur of the scores of Miklós Rózsa and Dimitri Tiomkin, Neef turns in a score that is simultaneously rousing and overblown. Primarily a classical composer, Neef’s score functions well enough on its own. In fact, if taken out of context and played by an orchestra, I suspect the score would work even better. The Ernst Thälmann films were some of the most viewed films in the DEFA library, but those statistics are a little misleading. The Thälmann films were virtually required viewing in the GDR. Students and factory workers were bussed on field trips to movie houses to watch them. Almost everyone growing up in the GDR remembers watching these films at some point during their school days. History has not been kind to Ernst Thälmann. It was he, after all, who was most responsible for splintering the German left wing into virulently opposing factions. His refusal to back Wilhelm Marx in the 1925 run-off election is largely blamed for siphoning just enough votes away from Marx to ensure Paul von Hindenburg’s election, paving the way for Hitler’s rise to power. The fact that Thälmann courted the Nazi vote during that party’s early years and worked with them in an attempt to overthrow the socialist government in Prussia is unmentioned in the films. Also glossed over the movies is the Wittorf Affair, an embezzlement scandal in the KPD that got Thälmann kicked out of party duties until Stalin stepped in and used the situation to seal Soviet control over the KPD. A control that haunted East Germany to its very end. Since the Wende, many of the schools, streets, and parks named in his honor in the eastern states of Germany have been renamed. More recently, researcher Klaus Schroeder wrote a piece for Der Tagesspiegel suggesting that any remembrance of Thälmann is unwarranted.